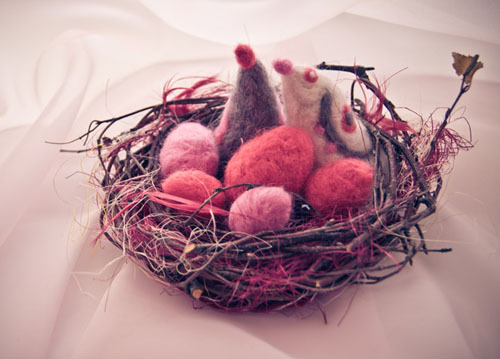 Handmade nests with birds and Easter egg decorations made of felt are beautiful Easter craft ideas that create colorful and eco friendly table centerpieces for spring holiday. 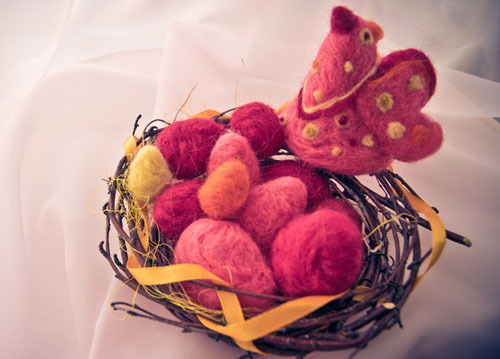 Felting allows to design Easter decorations for your table or window sills in any color combinations, adding bright and meaningful accents to Easter decorating ideas. Colorful Easter eggs are decorations that are charming and meaningful. Easter eggs in nests symbolize the new beginning, hopes and happiness, and are perfect for spring home decorating that brings nature inspired designs into modern homes. Spring is the time of fresh design ideas and experimenting with bold colors. Colorful Easter eggs in nests made of tree branches are gorgeous spring home decorating ideas. 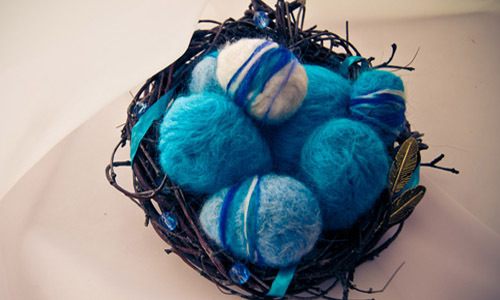 Designer Ju Petrenko who enjoys working with wool and felt, offers creative Easter craft ideas for making spring holiday decorations of this wonderful natural material. Vases, decorated with pompoms and flowers, birds and colorful egg decorations are great for creating spring table centerpieces for Easter. Cozy nests made of small tree branches, decorated with spring flowers, birds and colorful Easter egg decorations made of felt can be used for your home decorating all year around, adding organic forms, warm soft texture and your favorite colors to your rooms. Light green and blue color shades, creamy white, grayish and yellowish color tones, pink, red and orange, lilac and deep purple color shades are perfect for making bright, nature inspired Easter decorations of felt.